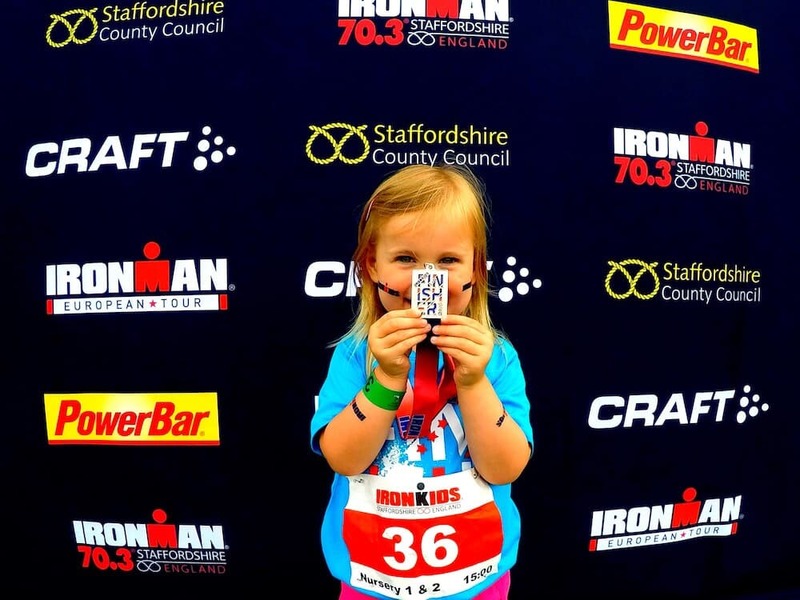 This weekend, IRONMAN 70.3 hit Staffordshire and we were there to get involved. I have completed a few physical challenges before; a marathon a mega cycle but never an Ironman. I’m not physically up to a challenge like this at the moment but the little lady had the opportunity to take part in IRONKIDS so we signed her up and started to train. The IRONKIDS event has a range of challenges for nursery age children right through to those who are older in school years 10 & 11 and what’s great is that the very youngest can have a parent to run alongside them. Cue my entrance for IRON…..KIDS. The races for the youngest eventers took place on Saturday with the IRONMAN taking place on Sunday at various locations across Staffordshire. Our race was hosted at Shugborough in front of the great House on a 500 metre track. The announcers built the atmosphere with a countdown and finally invited runners to the start line. Then, after a quick warm up, we were off. Xanthe was a superstar and ran the course with no fuss or falling. She paced herself and passed the finisher’s line to collect her medal to huge applause from the crowds that had gathered. Event registration opened on Thursday where the exhibitors’ tent welcomed participants of all abilities. We went along on Friday to soak up the atmosphere and suss out the route ready for race day. The organisation that goes into such a huge affair is colossal especially given the scale of the action for Ironman, but it seemed to me that IRONMAN organisers know exactly what they are doing. If you’d like to get involved and register for IRONKIDS, take a look at www.ironkids.com. To find out more about exciting things happening in Staffordshire, visit www.enjoystaffordshire.com.